Last day in June, ladies. Can you believe that half of 2014 is literally gone? Here's a virtual toast to all of you for much success and happiness in the latter half of this year! On to more cheery business - for those of you in the States, what are your plans for the upcoming July 4th holiday? This dress is so fun, I love how the stripes are different sizes and go in different directions. Best of luck with your move! Thanks, girl! I can't wait until it's over! Pretty dress! Good luck with the move! This dress is gorgeous! Good luck with your move! I honestly can not! Where does the time go? Love this striped dress, it's so unique! Time flies ... and makes me feel older and older, bleh! Can we talk about how cute you are? Good luck on the move! We will be celebrating my oldest turning 6 on the 4th, so we always have a little extra celebration on that day! Hope you can take a break and enjoy some festivities! Yay, happy b-day to your oldest! Wow! The dress and the patterns on it are gorgeous! Very form fitting and looks beautiful on you!! Good luck with moving..always hectic and tiring..keep cool and move on :D.
Form-fitting always makes me feel self-conscious. 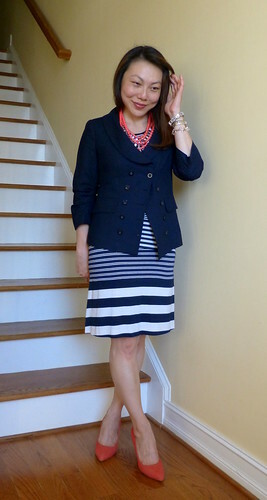 The mish mash of stripes kind of camouflages though and the blazer helps! This drss is gorgeous in you, and a perfect day tonight dress, too! Good luck with the move! I retaped and relabeled a few boxes that may have not gotten unpacked during my last move, hehe. Moving: boo. Your dress: yay! Love the unique stripes! 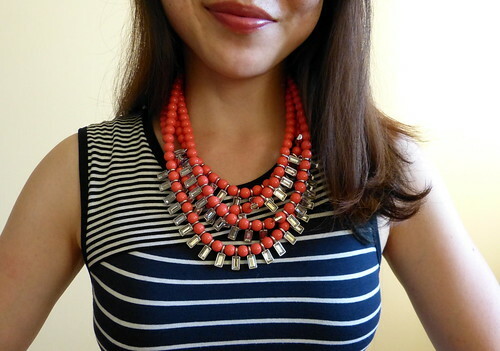 Love the stripes and the necklace too! Good luck with the move! Moving is always a stressful thing, so I'm sure you'll be happy when it's all over. Oooh! Love the stripes on this dress! It's fabulous. We are going to Marathon Key for the 4th. One last beach blast before we move north. Aw, sweet! Good luck with your move too! Awww, good luck with the move, girlie. You look lovely as always. I love this fun, funky stripe look! Moving is always exhausting, good luck!! Thanks, I'm exhausted just thinking about it, hehe. Moving is never fun but it's a great way to clean things out. Love this stripe dress on you! I've thrown a ton of stuff out and have loads of bags of stuff to giveaway to our local donations center. But what's scarier is the amount of stuff I still have and thus need to move! That dress is just fantastic, love it!! Moving is the worst! Hang in there! That dress. It makes you look curvy! Like you got a little something something going ON. I loooove it. Anything to fake some curves, hehe! Feel ya on moving! I just moved this past weekend and ugh, the worst. I love that dress, though! Not looking forward to it, but what's gotta be done, gotta be done! This dress is GORGEOUS and I love your layering of necklaces here! Love that dress! 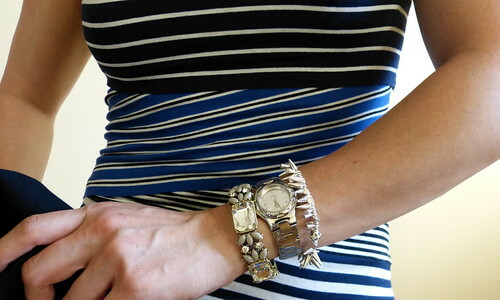 Love the different stripped patterns! So pretty! I love that blazer so much that I'm tempted to search Ebay for it! Your dress is so fun and unique with all of the different types of stripes. I like how you paired the coral pumps and necklace.